The El Paso Central Appraisal District is excited to announce that Mr. James E. Thompson Jr., Director of Appraisal Services, has been appointed by Glenn Hegar, Texas Comptroller of Public Accounts, to the Property Value Study Advisory Committee (PVSAC). Mr. Thompson will aid in advising the Texas Comptroller on the adoption of Property Value Study (PVS) rules and the procedures and standards for conducting and scoring the Methods and Assistance Program (MAP) review. James Thompson began his professional appraisal career with The El Paso Central Appraisal District (EPCAD) in 1994 as a Residential Field appraiser. Thereafter, he advanced through the ranks as a Senior Land Appraiser, Appraiser Analyst, Manager of the Residential Department, and to his current office as Director of Appraisal Services. Mr. Thompson’s career resonates with education. James holds a Bachelor of Science degree from Texas A & M University; and has completed multiple graduate courses at Texas Tech University. Aside from his designation as a Registered Professional Appraiser, James is a Certified Tax Administrator and is in the final stages of completing the International Association of Assessing Officers’ (IAAO) Certified Assessment Evaluator (CAE) and Assessment Administration Specialist (AAS) designations. His spectrum of experience includes being a State of Texas Approved Instructor for Property Tax core educational courses. Mr. Thompson’s dedication and experience within the assessment field are an invaluable asset to the EPCAD. We wish him the best in his new role. 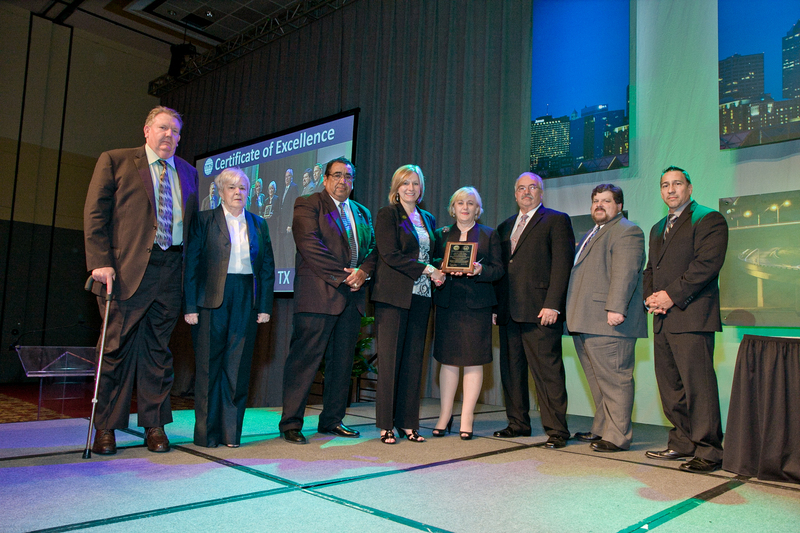 The IAAO’s Certificate of Excellence in Assessment Administration (CEAA) recognizes jurisdictions that utilize best appraisal and assessment practices in their offices. Since the program is directed at an entire jurisdiction rather than an individual, the requirements place a strong emphasis on teamwork and group achievement. Jurisdictions that earn this designation demonstrate a high level of proficiency in the assessment and appraisal disciplines to both their constituents and their peers. 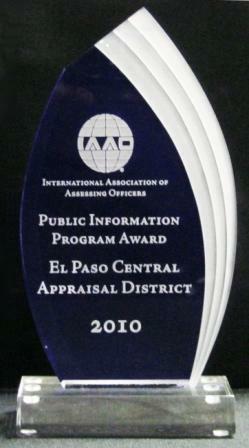 The IAAO recognized the El Paso Central Appraisal Districts' achievement in the development of an in-house Appeals Process Flow Management and Infomercial System by the Information Technology Department. This system directs the flow of the appeals process while providing property owners with a basic overview of the appraisal district and appeals process in both English and Spanish. The El Paso Central Appraisal District now joins Harris County Appraisal District as one of only two appraisal districts in Texas to have received this award. This award is given to assessment jurisdictions that have developed and implemented an effective system for the dissemination to taxpayers of information about the assessment process.